Check out some of our Cultural Competency Trainings for 2018! 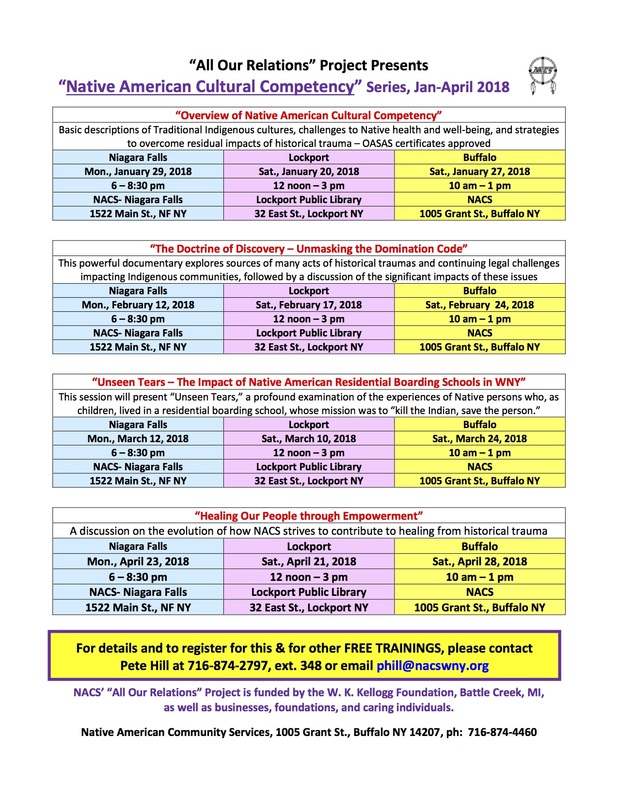 The AOR training series also discusses the many historical and related factors that have negatively impacted the health and wellbeing of many Native communities, while also explains how so many Native people may not speak their own languages fluently or may be experiencing some very challenging health or related impediments. Historical traumas and recommendations for greater understanding are presented so that more efforts to support Native communities can be more effective in engaging people and providing culturally-grounded services. The training series covers a wide variety of topics and sessions can be tailored for organizations, groups, and communities. All training sessions through “All Our Relations” are free. In addition to the trainings held at NACS, the “All Our Relations” Project can conduct focused trainings for organizations, service clubs, schools, and just about any other group, upon request. We can tailor cultural competency trainings to fit a wide range of audiences and services. Please contact Pete Hill, “All Our Relations” Project Director at phill@nacswny.org or 716-874-2797, exr. 348.